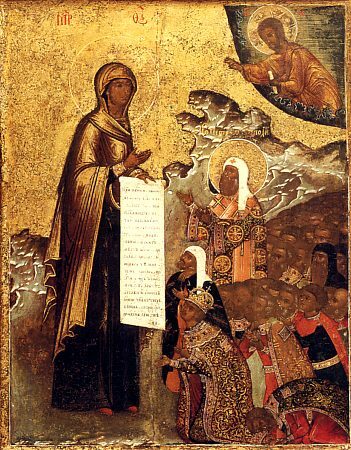 The Bogoliubsk Icon of the Mother of God, one of the most ancient wonderworking icons of Russia, was written in the XII Century at the request of holy Prince Andrei Bogoliubsky (Comm. 4 July), in memory of an appearance to him by the Mother of God. In the year 1155 holy Prince Andrei, having resettled from Vyshgorod to the Suzdal' lands, brought with him a wonderworking image of the Mother of God, written by the Evangelist Luke (this afterwards was called the Vladimir Icon). At seven versts distance from Vladimir by horse, the carrying cart with the wonderworking Icon stopped and was not able to be moved from the place. Holy Prince Andrei besought the priest Nikolai, who accompanied him, to make a molieben before the Icon of the Mother of God, and for a long time he prayed with tears in front of the venerable image. Later he went into his travelling quarters, but ceasing not in his fervent prayer. The MostHoly Mother of God during this point appeared to him with a small scroll in Her hand and commanded the pious prince, that Her image brought from Vyshgorod should remain at Vladimir, and that on the location of Her miraculous appearance there should be built a church and holy monastery. She then prayerfully pointed Her hand to Heaven, and having received blessing from Christ the Saviour, Who appeared at this time over the earth, and with His blessing to Her the vision ended. In fulfilling the command, holy Prince Andrei built upon the indicated place a stone church in honour of the Nativity of the MostHoly Mother of God, and also a monastery formed there. And afterwards the holy prince commissioned talented iconographers and asked that the Mother of God be depicted such as he had seen Her in the vision: in full stature and with the scroll in Her right hand, and Her face turned towards the Saviour. When the construction of the church was completed, the image was installed in it and a yearly celebration in honour of the appearance of the Mother of God was established under 18 June, which then came into useage in the Russian Church. The monastery, and the city which formed around the monastery, was named Bogoliubov by Saint Andrei, because in his own words, "the Mother of God loves this place", and the prince himself came to be called Bogoliubsky or "God-lover". The wonderworking image of the Mother of God, brought from Vyshgorod, was afterwards transferred from the Bogoliubovsk monastery to Vladimir into the Uspenie-Dormition cathedral, but the icon of the Appearance remained at Bogoliubov and was called the Bogoliubsk (at the present time of 1978 the icon is in the Vladimir-Suzdal' Museum collection). The image of the Bogoliubsk Mother of God was glorified by innumerable miracles, and over the space of many centuries manifest its grace-bearing help to the believing amongst the Russian nation. The fame of the miracles and signs wrought by the icon impelled believers of many places in Russia to avail themselves of copies of the venerable image, widely distributed and graced in power.